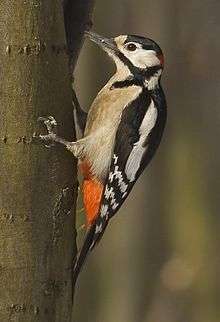 Nine families of largely arboreal birds make up the order Piciformes, the best-known of them being the Picidae, which includes the woodpeckers and close relatives. The Piciformes contain about 67 living genera with a little over 400 species, of which the Picidae (woodpeckers and relatives) make up about half. In general, the Piciformes are insectivorous, although the barbets and toucans mostly eat fruit and the honeyguides are unique among birds in being able to digest beeswax (although insects make up the bulk of their diet). Nearly all Piciformes have parrot-like zygodactyl feet—two toes forward and two back, an arrangement that has obvious advantages for birds that spend much of their time on tree trunks. An exception are a few species of three-toed woodpeckers. The jacamars aside, Piciformes do not have down feathers at any age, only true feathers. They range in size from the rufous piculet at 8 centimetres in length, and weighing 7 grams, to the toco toucan, at 63 centimetres long, and weighing 680 grams. All nest in cavities and have altricial young. The Galbulidae and Bucconidae are often separated into a distinct Galbuliformes order. Analysis of nuclear genes confirms that they form a lineage of their own, but suggests that they are better treated as a suborder. The other families form another monophyletic group of suborder rank, but the barbets were determined to be paraphyletic with regard to the toucans and hence, the formerly all-encompassing Capitonidae have been split up. The woodpeckers and honeyguides are each other's closest relatives. According to some researchers, the entire order Piciformes should be included as a subgroup in Coraciiformes. Reconstruction of the evolutionary history of the Piciformes has been hampered by poor understanding of the evolution of the zygodactyl foot. A number of prehistoric families and genera, from the Early Eocene Neanis and Hassiavis, the Zygodactylidae/Primoscenidae, Gracilitarsidae, Sylphornithidae, and "Homalopus", to the Miocene "Picus" gaudryi and the Pliocene Bathoceleus are sometimes tentatively assigned to this order. 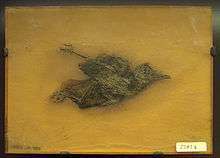 There are some extinct ancestral Piciformes known from fossils which have been difficult to place but at least in part probably belong to the Pici. The modern families are known to exist since the mid-late Oligocene to early Miocene; consequently, the older forms appear to be more basal. A large part of Piciform evolution seems to have occurred in Europe where only Picidae occur today; perhaps even some now exclusively Neotropical families have their origin in the Old World. ↑ Lanyon, Scott M.; Hall, John G (April 1994). "Reexamination of Barbet Monophyly Using Mitochondrial-DNA Sequence Data" (PDF). The Auk. 111 (2): 389–397. doi:10.2307/4088602. ↑ Johansson, Ulf S. & Ericson, Per G.P. (2003). "Molecular support for a sister group relationship between Pici and Galbulae (Piciformes sensu Wetmore 1960" (PDF). Journal of Avian Biology. 34 (2): 185–197. doi:10.1034/j.1600-048X.2003.03103.x. ↑ Hackett, Shannon J.; Kimball, Rebecca T.; Reddy, Sushma; Bowie, Rauri C. K.; Braun, Edward L.; Braun, Michael J.; Chojnowski, Jena L.; Cox, W. Andrew; Han, Kin-Lan; Harshman, John; Huddleston, Christopher J.; Marks, Ben D.; Miglia, Kathleen J.; Moore, William S.; Sheldon, Frederick H.; Steadman, David W.; Witt, Christopher C.; Yuri, Tamaki (2008). "A Phylogenomic Study of Birds Reveals Their Evolutionary History". Science. 320 (5884): 1763–1768. doi:10.1126/science.1157704. PMID 18583609. ↑ Described in 1870, its name is preoccupied by a subgenus of Cryptocephalus leaf beetles described in 1835. ↑ "CMC 152", a distal carpometacarpus; more similar to extant barbets than to Capitonides: Ballmann, Peter. "Les Oiseaux miocènes de la Grive–Saint–Alban (Isère)" [The Miocene birds of Grive-Saint-Alban (Isère)]. Geobios (in French and English). 2: 157–204. doi:10.1016/S0016-6995(69)80005-7. Wikimedia Commons has media related to Piciformes.